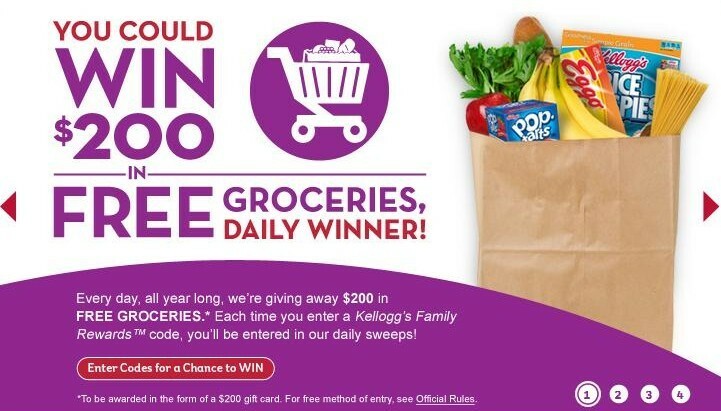 Win a $200 Grocery Gift Card! Click the image above to enter. 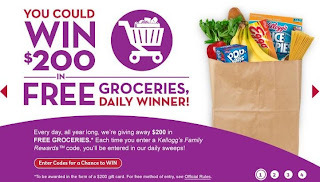 The Kellogg's Family Rewards Program is giving away a $200 gift card every day! For your chance to win, all you have to do is enter codes that you find on select Kellogg's products. When you enter codes, you also get points that you can redeem for great coupons, gift cards and more! Here's five codes and 150 points to get you started. (NOTE: Free codes can expire at any time) You get one entry for each code you enter...good luck! Click the "Save up to $10" image above to sign in or up for the rewards program, and enter the codes.